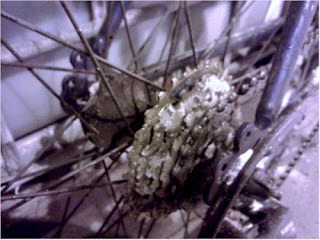 You know, this thing was performing surprisingly well considering how much slushy crud had accumulated in it. I have fenders for this bike but haven't installed them yet. It is my hope that a front fender with a great big mud flap may reduce some of this buildup, but this kind of thing is usually inevitable in my experience. The result, often, is that you end up with only one usable gear out back. In my case, since I'm only using one front chainring, that translates into one gear period. Knowing this, I often choose to spin a little more than I normally would since getting stuck with a gear that is too high can prove troublesome in the deeper stuff. Don't get me wrong, I'm not complaining. It was clear and -7 C this morning, a beautiful kind of weather for winter riding, and the bike and tires did very well in a really wide variety of road conditions. In a winter that hasn't been very wintery thus far, this morning's commute was lots of fun. Yes we have been blessed with easy weather so far. I dont worry too much about the slush back there, it never seems to give me much issue. I have Video of Friday mornings ride, similar conditions to today. Could have used studded tires tho. Why dont we see any videos from you anymore?? Yeah, I've got some video from Friday showing some different behaviour from me due to conditions too. I do have studded tires and they were a blessing Fri and today. I hadn't been riding enough to get any interesting video, but I'm getting back at it now. If only I had time to process it or write more blog posts! 63-inch fixed gear. Laugh at shifting issues, have instant speed control independent of brakes, keep yourself warmer by constant pedaling. Needn't be 63-inch, that just seems to be the best all-around gear on flat to rolling terrain. 25 mph is in reach, but starting up from stops isn't a lot of work. Makes you spin round and smooth, but that's just a good thing. In summer I ran 67-inch in Maryland, but I use a two-sided hub up here, with 63 on one side and 72 on the other. I miss living in an area where I would commute by bike even in questionable weather. If things were too slippery or sloppy I would walk. Losing that is one major down side to living in a very rural area. Cafiend - You know I ride fixed in summer, but I can't get my head around fixed in winter, only because in truly deep snow conditions I start and stop and need in and out of pedals PLUS a very low gear just to get it moving sometimes. I believe that my average winter ride would be great on a fixed... it is the exception of deep snow I worry about. I hear you on the rural thing... I have often walked it for a while when riding proved near impossible or just unsafe. Might want to think about the internal hub with the gates belt drive. Probably already have though.